Dh wanted something different last Friday night for dinner. Not pizza, not fish sticks, pasta or tuna patties. Simply put, we wanted something different. We put our noggins together and came up with fish tacos; we all eat and enjoy them. Now we wanted fresh fish so off he went and found a recipe to try while I went and bought the fish. We did make some slight substitutions to the recipe. I used talapia instead of the cod and for the cabbage I added some apple cider vinegar over top with salt and pepper. Then sat that to the side to let it mellow a bit. Oh! We used soft taco shells they were alright but hard shells would be much better. Combine sour cream, mayonnaise, cilantro and two tablespoons of the taco mix in a small bowl. Combine Cod, canola oil, lemon juice, and remaining seasoning mix in a medium bowl; pour into a large skillet. Cook, stirring constantly, over medium-high heat for 4-5 minutes or until fish flakes easily with a fork. 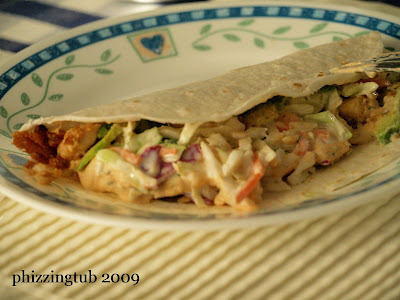 Fill taco shells with fish mixture. Top with cabbage, tomato, sour cream mixture, lime juice and taco sauce. Per Serving : 922 Calories; 83g Fat (79.5% calories from fat); 17g Protein; 32g Carbohydrate; 3g Dietary Fiber; 41mg Cholesterol; 634mg Sodium. Exchanges: 1 Grain(Starch); 2 Lean Meat; 1/2 Fruit; 16 1/2 Fat; 1/2 Other Carbohydrates.